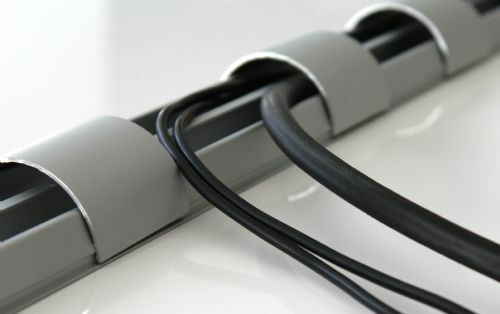 Click 'n Slide is a high quality product from BOSSCOM made of 100% aluminum for the management of cables and wires in places where you need to hide but have access to them at all times. For example under desks, shelves or wardrobes. Extruded aluminum with designed protection click, what ensures an easy and clear cable protection. Click 'n Slide is designed so that cables can be easily placed and removed from the cable tray. The different aluminum covers that keep cables tidy and protected can slide from side to side so you can easily adapt the holder to the number of cables you need to keep tidy in the different situations. Click 'n Slide can be easily screwed under the table desk through the premade holes in the track. Click 'n Slide is available in 0.75, 1.5 and 2.5 meters length and 33/50/80mm width, in three different colors: black, white or aluminum. Delivery: Login EUR € Login Qty.